Since 1917, Keansburg has boasted a colorful history and has attracted visitors from Northern New Jersey and New York – due to its convenient location. Starting out as a fishing hamlet and later, blooming into a resort area for North Jersey and New York City visitors – Keansburg is uniquely positioned as the closest shore destination stop along the Jersey shore for folks traveling from the North. Visitors have long been attracted to the town’s location, natural beauty, wildlife, fishing, water recreation activities as well as its amusement park, with origins that date back before the Borough was officially incorporated. In 1960’s, Keansburg transformed from a summer resort into a year-round residential town, with residential neighborhoods, schools and stores. A major highlight in Keansburg’s history is the Keansburg Amusement Park. Having just celebrated its 110-year anniversary (2014), the park is actually older than the municipality and can be credited with being the catalyst to the Borough’s establishment. The Amusement Park (referred to as the “boardwalk” by the locals) was a major attraction through the 1980s, and today reclaims that identity, thanks in large part to the Gehlhaus brothers (whose family founded the Steamboat Company in 1910 and were the original owners of the park). They repurchased the park in 1995 and added a Water Park to assist in bringing the park back to its former glory. 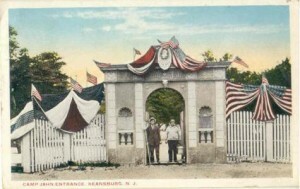 Today the Keansburg Amusement Park has remained a major attraction, drawing in thousands of visitors from April to October. 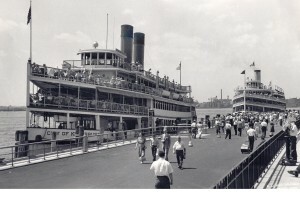 Prior to the arrival of the automobile and with the advent of the amusement park, transportation was crucial to the success of this now recreation-oriented resort. Water-borne traffic became the transport of choice; and in 1910 the Steamboat Company was founded and began the era of steamboat transportation from New York City to Keansburg. ‘The City of Keansburg’ ship – the first in a small fleet of steamships to be owned by the company – made three round trips daily in season from New York City – until a 1962 hurricane destroyed the docking pier and effectively ended the steamship run in 1968.